This week brings to a close the week of blatantly shilling for the Dungeon Fantasy RPG Kickstarters. Both Citadel at Nordvorn and the Dungeon Fantasy Monsters 2 and Boxed Set Reprint campaigns end this weekend, with DFM2 closing tomorrow (Friday), and Citadel coming to an end on Sunday. Both funded and passed at least one stretch goal, and Citadel – which had fewer to begin with – is on the cusp of passing another. The DFM2 campaign is currently past $50,000, and since one can see an additional 20-25% funding in the last two days of a campaign, it’s not over yet to get the $60,000 stretch goal. If you’re a backer, you can also answer Phil Reed’s question “What next?” by commenting on Update 14. The Citadel at Nordvorn turned from “gee, that’s worrisome” at the beginning to “Gaming Ballistic’s Best Kickstarter Ever.” It is already the best funded by several thousand dollars, and has 515 backers, which is 10 fewer than Hall of Judgment ended with, and 100 more than Hall of Judgment was three days before it ended. It’s already at 112 pages, Fantastic Dungeon Grappling will be inside the boxed set, and we’re $500 from making it 128 pages. From this point in HoJ to close, it picked up 26% additional funding. If we do that from here, the campaign will hit $24,570 . . . just $430 short of the offset print run. Of course, to do that, we’ll need 144 more backers at the current average pledge level. That last goal is going to be close! We have a new blog this week! Three Hundred and Thirty Three, by Michael Keenan, who has started off strong with ten posts this week! This week and next week will continue the string of “rah rah!” GURPSDays. Still looking to rally support for the two Kickstarters going on that influence the future of the Dungeon Fantasy RPG specifically, and GURPS more broadly. Let’s start with the big one. This one’s important, and it’s 83% funded! It’s been having some very good days, but it can use more. It’s on track to hit about $50K, but it has to fund before it starts hitting stretch goals. I think it’s important, especially for those that passed on the first Kickstarter, to pay attention to this one. Why this? Why more fantasy? Why not leverage GURPS to do something that isn’t D&D? There have been GURPSy releases that are not Fantasy. Even sub-lines, such as Monster Hunters and After the End. Many volumes of Spaceships! Steampunk now has three releases. Good stuff, all. But there have been 20+ volumes of GURPS Dungeon Fantasy. Other genres clearly didn’t generate the sales, the inspiration for authors to step up and write books in those genres, or both. I like other stuff too! I’d dearly love to see some modern-day boxed set/subline love. I’d also like to see characters of 100-200 point variety featured more prominently. But between what folks are willing to write, and what folks have been buying, Dungeon Fantasy has been the obvious and repeated winner. Winner and still champion, as it were. So they’re not just handing the ball to the guy and having him slam his face into the scrimmage line. There’s their own sales data and feedback from shows, cons, reviews, emails to the SJG staff, etc. that back it up. Which comes back around to “PLEASE back both DFM2/Boxed set and (self-interest alert!) Nordvorn. If these do well, someone like myself could ask to do something not-Fantasy. If they don’t . . . there might be nothing at all. We funded!! We hit the $13,000 goal – the highest of any Kickstarter of mine to date – and are now past $14,000. Going strong! At the current trajectory, we’ll likely pass the first stretch goal. We have enough backers following but not yet pledged to go all the way to the offset print run at $25,000 . . . in fact if all the latent backers came in at the current average pledge, we’d have over $26,000 now! My best ever latent conversion rate was 41%, on Hall of Judgment. That’s 95 people who are statistically likely to come over, which is $3,400. So it looks really good for the first stretch goal . . . and we’ll see about more! If you can manage to throw in early, please do so. The latest updates can be found below, in the Gaming Ballistic section. As noted above, the key to success for both campaigns is new folks. In particular, retail stores and bulk orders are really key. They are more likely to bring in new players, and they tend to order many copies, which helps push up the numbers for print runs, and large print runs are better on a marginal cost basis. That means more financial success for the line, which means we want to do more, better, and faster. Jump over to this thread on rpg.net, and let folks know about Citadel (the new set discussion starts on p. 88). Tell them about Hall of Judgment, if you have it or have played it, or point them to reviews if you haven’t. Share this Facebook or this tweet. The more folks see it, the more attention, and the more backers we can get. This has knock-on effects! More than one site, like Kicktraq, uses the number of comments and the general buzz about a project to decide how to feature it. Do the same thing for the Boxed Set. I can’t stress this enough: without the Boxed Set and continued interest and support from both backers and Steve Jackson Games, there’s no product line for me to support. Share play stories. Talk to your local game stores this weekend. Both the Boxed Set and Nordvorn have retail levels where you can get more than one copy of the game at a significant discount. A quick note: I’m getting five blogs that pull up empty each time. I’ll contact the owners, but check your settings, too! Today is an unusual “GURPSDay.” Unusual because there are two Kickstarters going on that influence the future of the Dungeon Fantasy RPG specifically, and GURPS more broadly. So this is going to be a bit of “rah, rah” and a tetch of hard sell. This one’s important. It’s being used to judge latent demand for the game, and the boxed set does that. The Monsters book is something that we’ve all been asking for. For a long while. If you’re neither following the campaign nor pledged, please do one or both. Thanks to beautiful synergies with the DFM2/DFRPG campaign, we got a much-needed and much appreciated kick in the pants these last few days, and are only $1800 from funding. There are 275 folks following the campaign who have not yet pledged. If 60 come in and pledge, we fund. If you ALL came in and pledged, we’d hit two stretch goals and the book would be 128 pages. We’d need 150 people past that to hit the offset print run goal. The common denominator for both campaigns is (a) they haven’t funded yet, and (b) early funding is actually really important. Once you fund, you can start confidently writing checks for things. In my case: while I took a financial risk (but not a competency one!) doing so, I hired an editor last night. More on her in an update later today. But for my art, which is the lion’s share of the cost of my book, I am not reaching out to artists, and committing their time, until we’re funded. If we funded tomorrow, I’d start talking with my artists – and especially my cartographer! – immediately. From SJG’s perspective: I can’t say. But once it funds, I have to assume that there’s a bunch of folks that can be put on duty making the game happen. For now, they’re working other things. Or so I speculate. In either case: early funding is always important, and if you can manage to throw in early, please do so. Thursday is again GURPSDay, though I’m posting on a Friday. How very LEGO Movie. An eventful week for GURPS. Don’t believe me? Fine! Check out the GURPS News, which is chock full of new info. Also SJG released Steampunk 3: Soldiers and Scientists yesterday. Dungeon Fantasy Monsters 2 was put on the “watch this space” calendar, and both the Foreword for Citadel as well as a few other places confirm “March” as the Kickstarter launch date. Since the Pocket Box Kickstarter ends today, perhaps next week? Perhaps a week to breathe? We shall see . . . but it’s close. Also, The Citadel at Norðvorn went live on Kickstarter Tuesday, Feb 19. We’re at just over $8,100, which is 62% funding, as of this note. There are also 179 or more folks following the campaign that haven’t jumped in yet, so the potential to fund is there. As a personal plea: if you can do it, jump in early. I like to get started on things sooner rather than late, and funding means I can commission artwork confidently and start engaging the rest of my team. The future of Citadel isn’t quite the future of the DFRPG, but the two are linked, as well as the success of Dungeon Fantasy Monsters 2. Go read Sean Punch’s entirely fascinating foreword to Citadel. I also teased the cover to another upcoming volume of my own: “Fantastic Dungeon Grappling.” This short book (no longer than 16 pages) will revise and extend the short-and-sweet grappling rules from Hall of Judgment. The Citadel Kickstarter will be the place to get it when that add-on goes live, as well as a spiffy set of bookmarks for monsters and characters to keep track of control points, laminated so you can use them with dry-erase markers. The Lost Hall of Tyr 2nd edition physical print proof from both printers arrived. The US printing is finished and 10 boxes of books will arrive at my house today. The UK printing loks good in most respects, but the art was streaky and showed striations that my wife pointed out in the artwork. They’re re-doing the proof to make sure it’s at least as good as the most excellent Hall of Judgment printing, also done by them. The US books will thus arrive three months early; the UK books probably closer to two. I posted a hoped-for publishing schedule for me in 2019. Also: I received the first full manuscript for The Fantasy Trip, by Christopher R. Rice. I am expecting to receive a second one by David Pulver any moment now. TFT fans will recognize those two names as having already published TFT adventures, and these two are the first of the ten I’m contracted for in 2019. More on that later . . . but I can confirm these are all different, and none of them are set in Norðlond for the moment. Could these be worked backwards into GURPS or Dragon Heresy? Absolutely . . . but first play ’em in TFT! Thursday is the Citadel at GURPSDay, and this has been a great week for GURPS. Don’t believe me? Fine! Check out this awesome list of GURPS stuff on the horizon. Dungeon Fantasy Monsters 2 was put on the “watch this space” calendar. SJG doesn’t do teasers – they’re either ready to rock, or they keep quiet. So look for this one. Also, The Citadel at Norðvorn went live on Kickstarter this past Tuesday, Feb 19. We had an amazing first day, and can use your help getting to first the basic funding goals, and then pushing to the stretch goals for a larger book and better printing. Sean Punch wrote an entirely fascinating foreword to the book that every GURPS fan should read. 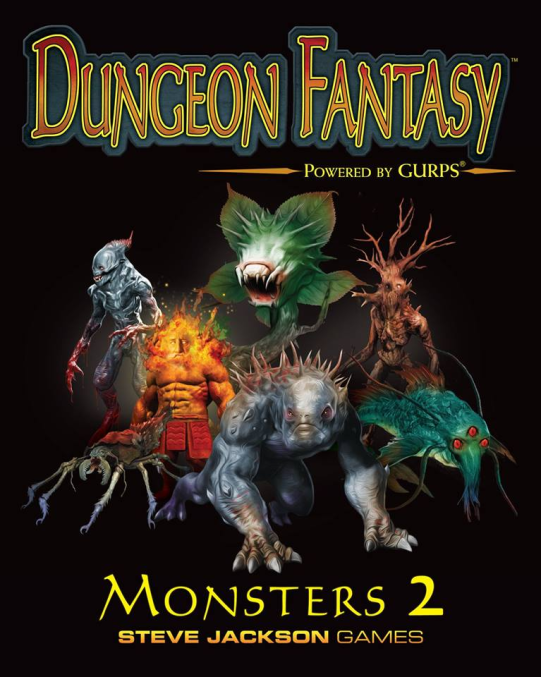 It also hints of the next big Dungeon Fantasy RPG happening: Dungeon Fantasy Monsters 2, which will be Kickstarting in March. If it funds, we will also see a reprint of the Boxed Set! I will be on Geek Gab’s Game Night – for the third time! – starting at 9pm Central Time to chat about Citadel, GURPS, TFT, Dragon Heresy, Vikings, and trying to run an indie game company. Check it out here at the appropriate time! The Lost Hall of Tyr 2nd edition physical print proof from the US printer were approved today. Based on their projections, that project should complete something like two months early. Thursday is GURPSDay, Valentine’s Day, and a great day for the Dungeon Fantasy RPG. Also, The Citadel at Nordvorn will go live on Kickstarter on Tuesday, Feb 19. Return to Nordlond about 250 miles east of Isfjall as the raven flies . . . and check out the Kickstarter preview. The Lost Hall of Tyr proofs are on the way; I should get one from the US printer today even! The graphic design of Citadel got a major overhaul, and the Kickstarter is ready to go; it’s even approved by KS launch control. I received word from my authors on TFT projects that the first two (one from each) are over 75% completed for writing. Thursday is GURPSDay, and I’m on time this week! The Lost Hall of Tyr final PDF was sent to backers, and then on to the printer. They’re in pre-flight. Re-read Citadel. It’s fundamentally sound in the backdrop, now I have to flesh out the relationships, factions, and add encounters. Thursday is GURPSDay, and I’m posting to ensure all Thursday posts got caught. Yeah, that’s my story and I’m sticking to it. I posted a hoped-for publishing schedule for me in 2019; check it out after the break.